In the days of Darwin and even as recently as the mid twentieth century, scientists thought that life began in some little pool beneath the rays of our local star the Sun. Now however, as the result of some astounding discoveries in the depths of the sunless oceans of our planet, it is thought that life began in an environment as alien as anywhere could be in our universe. It is thought to have started near the 'Black Smokers' and 'White Smokers' that arise from the undersea volcanoes in the depths of the abyss. Undersea volcanoes are often associated with oceanic plate boundaries such as the mid-ocean ridges. It is here that the seafloor spreads and forms the edges of the oceanic plates. "We have known more about the topography of Venus, Mars, and the Moon than the bottom of our own oceans - until today," said Dr. Walter Smith of the United States National Oceanic and Atmospheric Administration (NOAA) as he introduced a stunning new map of ocean floor structures. The oceanic plates meet along the mid-ocean ridges. The principal oceanic plate boundries on the map are shown as black lines surrounded by red areas. It is here that magma rises from the sea floor pushing the plates away. This can be clearly seen by looking at the map diagram created by NOAA on the left above. 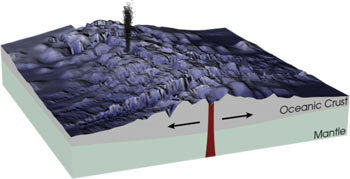 The diagram on the right below, courtesy of NASA, shows how magma erupts along a mid-ocean ridge. Iceland and the Galpagos Islands are the tops of volcanoes that erupt beneath the oceans. Under the waves, long hidden from our site are undreamt of wonders – vast plains of basaltic rock stretch for enormous distances and great mountain chains rise from the ocean depths. The Challenger Deep in the Mariana Trench in the north-western Pacific is the deepest point in Earth's oceans. The bottom there is 10,924 meters (35,840 feet) below sea level. If Mount Everest, the highest mountain on Earth, were placed at this location it would be covered by over one mile of water. The Challenger Deep is named after the British survey ship Challenger II, which discovered this deepest location in 1951. It was long realised that just as volcanoes occurred on the land, they must also occur under the oceans. It was not factual proof of these volcanoes that was so important it was the discovery of vast new colonies of life around the volcanic vents - a discovery of momentous significance to the theories of the origins of life. Hydrothermal vents occur at ocean spreading centres, that is, at locations where tectonic plates are pulling apart, creating new ocean floor as volcanic material rises to fill in the space between the plates. At spreading centres ocean water infiltrates the ocean floor and mixes with molten crust, after which hydrothermal fluids rise back to the surface of the sea floor. As hydrothermal fluids return to the ocean floor, they exit through narrow chimneys. These chimneys are of two types known respectively as 'black smokers' and 'white smokers'. Exiting fluids range in temperatures between 300-400 degrees C and are rich in hydrogen sulphide, heavy metals, and other elements. The high temperatures of vent fluids cause them to be more buoyant than ocean water. 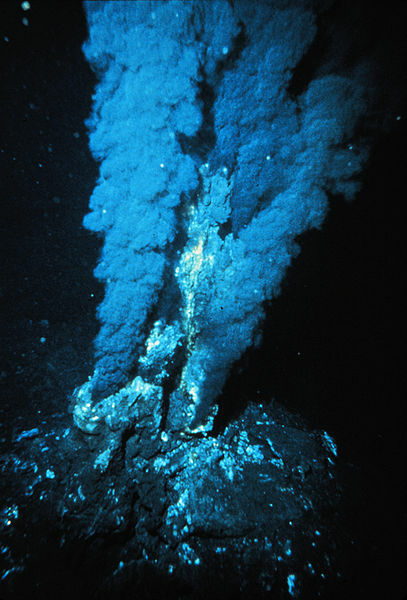 As hydrothermal fluids escape into the ocean, they form buoyant plumes that rapidly mix with the surrounding seawater. The plume rises until the fluids mix sufficiently to reach a state of neutral buoyancy. At this point the plume spreads out horizontally: ocean currents then dictate further mixing and movement. In 1977 a robotic submersible called Alvin first located a black smoker on the ocean floor near the Galapagos Islands. Alvin was the first deep-sea submersible capable of carrying passengers, usually a pilot and two observers. Now, after numerous upgrades and reconstructions, Alvin can plunge to a maximum depth of 14,764 ft.
Just as the space shuttle is built to withstand the near total vacuum of outer space, Alvin is built to withstand the crushing pressure of the deep ocean. The titanium-hulled sub can remain submerged for 10 hours under normal conditions, although its life support system will allow the sub and its occupants to remain underwater for 72 hours. About 20 to 25 million years ago, the Pacific and Farallon tectonic plates were spreading apart beneath the eastern Pacific Ocean. But about 20 million years ago, the Farallon Plate began to tear near the present location of the Galapagos Islands. The small tear grew larger. It split the Farallon Plate into two separate plates--the Nazca Plate to the north and the Cocos Plate to the south. In the opening created by the tear, magma rose to create the Galapagos Spreading Center. The Galapagos Spreading Center steadily added new ocean crust to the Cocos and Nazca Plates as the tear continued to rip westward toward the Pacific Plate. It was into this region that the Alvin began making its momentous voyage of discovery in 1977. The illustration and the information is credited to an excellent web site from the Woods Hole Oceanographic Institution celebrating the twenty fifth anniversary of the 1977 expedition. Much to the amazement of the scientists involved in the venture, it was found that the hydrothermal vents supported a rich and varied biosphere. It was a discovery of enormous importance in the understanding of life and of it possible origins. The first major discovery of volcanic vents was made when Alvin investigated vents close to the Galapagos Islands. The really amazing part of the expedition was the discovery that a vast number of animals and microorganisms congregated around the vents. This led to the revolutionary theories about the origins of life itself. Present theories about life's origins are that it began in the vicinity in thermal in deep water where sunlight never penetrated. This is far from the original concepts which started with darwin and continued into the mid-twentieth century that life began in the shallow waters of a continental shelf bathed in sunlight. The water that issues from seafloor hydrothermal vents consists mostly of salty sea water drawn into the hydrothermal system close to the volcanic edifice through faults and porous sediments or volcanic strata, plus some magmatic water released by the magma upwelling from the vent. In contrast to the approximately 2°C ambient water temperature at these depths, water emerges from these vents at temperatures ranging from 60°C up to as high as 464°C. 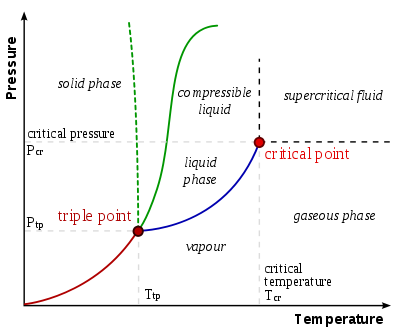 Due to the high	pressure at these depths, water may exist in either its liquid form or in the form of a supercritical fluid at such temperatures. At a barometric pressure atmospheres, the critical point of water is 375°C. At a depth of 3,000 meters, the barometric pressure of sea water is more than 300 atmospheres (as salt water is denser than fresh water). 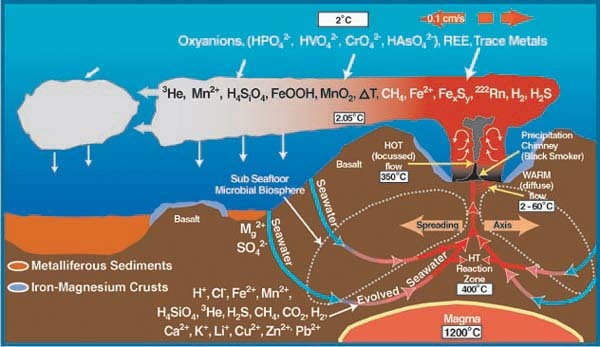 At this depth and pressure, seawater becomes supercritical at a temperature of 407°C (see the diagram on the right above). However the increase in salinity at this depth pushes the water closer to its critical point. Thus, water emerging from the hottest parts of some hydrothermal vents can be a supercritical fluid possessing physical properties between those of a gas and those of a liquid. Besides being superheated, the water is also extremely acidic often having a pH value as low as 2.8. As seen from Alvin, the vents were of two different types, one black, the other white. The vents have since been referred to as ‘black smokers’ and ‘white smokers’. Black smokers have fluid temperatures of more than 360 °C, whereas white smoker fluids are generally lower in temperature (260–300 °C). Once the vent water enters the sea, the hot fluid mixes with sea water and the dissolved constituents rise because of the buoyancy resulting from the higher temperature. These structures are generally referred to as plumes. Black smokers contain large quantities of iron and other black metallic sulphides. White smokers contain zinc sulphide and compounds of calcium and barium which are white in colour. Geologists are intrigued by how rapidly vent chimneys grow - up to 9 meters (30 ft) in 18 months. A scientist at the University of Washington has been monitoring the growth of "Godzilla," a vent chimney in the Pacific Ocean off the coast of Oregon. It reached the height of a 15-story building before it toppled. The illustration on the left is of a black smoker in the mid-Atlantic ridge. The right hand il illustration show a white smoker in the Mariana Trench in the western Pacific known as the The Champagne vent. Both illustrations are from the photo-library of NOAA to whom acknowledgement and thanks are given.